Venus Lau is a curator and writer based in Shanghai and Shenzhen, where she is artistic director of OCT Contemporary Art Terminal. 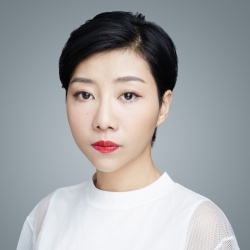 She won the Chinese Contemporary Art Award jury’s prize with her proposal to rethink strategies of institutional critique within a Chinese context while exploring the links between ontology and objecthood in art. She is the curator of the “Secret Timezones Trilogy” at Ullens Center for Contemporary Art (Beijing), an exhibition series comprised of solo presentations by Korakrit Arunanondchai, Ming Wong, and Haegue Yang. Laualso curated “Digging a Hole in China”, “Summer Triangle: Jon Rafman, Adrian Wong, Lantian Xie”, “Jiang Zhi: All” and "Simon Denny: Real Mass Entrepreneurship "at OCAT Shenzhen. She co-curated “rites, thoughts, notes, sparks, swings, strikes. a hong kong spring” with Cosmin Costinas at Para Site, Hong Kong. She is the editor of publications including Cao Fei: Splendid River and Certain Pleasures: A Zheng Peili Retrospective.